It's not quite as easy as it could be, but it's a relatively pleasant experience that may save you a few dollars each month. When Frontier Communications (NASDAQ:FTR) first took over AT&T's (NYSE:T) U-verse cable and Internet provider in the area where I live, I was immediately intrigued. AT&T had never served my condo complex, but when Frontier bought the territory, I started getting mail with offers at prices much low than what I was paying Cox, my current provider. At least somewhat tempted, I called the number on the flyer that had been mailed to my home (more than once) to inquire about the deal. After a few minutes on hold, I learned that Frontier still did not serve my address, but that the company was imprecise with its mailings. Blocked from switching companies in order to pay less, I called Cox and told them I was leaving unless they lowered my rate. That gambit failed, as it seemed my current provider was well aware that I had limited other options (I could use satellite for cable, but had no alternatives for Internet service). So, with a heavy heart and a lighter wallet I resigned myself to a monthly bill that ran just over $182 for cable (including one full-sized box, two mini-boxes, as well as HBO) and broadband Internet. Frontier still advertised heavily in the general vicinity of my house, and it continued to send me mailings offering great deals on services it did not provide for me. I completely ignored them and the company until one Friday afternoon in early September, when, while taking some trash out, I noticed a salesman heading toward my front door wearing a shirt with the Frontier logo. "You don't service this complex," I told him as he approached. "You send me mail offering great prices, but you're not wired for these condos." That, he told me, had changed, and he had even signed up one of my neighbors. That's when I asked him for pricing, and everything got a bit confusing. Neither the Frontier website nor the Frontier salesman could give me an exact price. The website has lots of offers, but at no point (or at least no point which I could determine) does it ever say, "this is what you will pay each month with taxes, fees, and any other bonus charges the company tacks on." The same was true of the salesman. He had a key of sorts that allowed him to come up with the package price based on which cable channel/Internet deal I selected and the number of TVs I want to use it on. He was able to tell me my monthly pre-tax cost would be $137, but he was unable to state what I would actually pay. Even a call to his manager -- who, like the salesman, was a friendly professional -- was only able to determine that my actual bill would be for less than $150 each month The manager assured me there were no hidden surcharges and said the reason for the lack of precision was due to the differing tax codes in the various areas the company serves. Assuming my actual bill comes in under $150, I'll be saving around $30 off my current one for more channels and the promise of faster Internet. The salesperson arranged an installation date for me, letting me pick a day and a four-hour window. He also called two days before the install to remind me and see if I had any questions. On install day, the technician called at 9 a.m., an hour into the 8 a.m. to noon window, letting me know he would be arriving in 30 minutes. The install took over three hours, but I wasn't involved other than pointing out where my TVs were located. The technician, however, did have one surprise for me: The package I had bought did not include HD service. Adding it, which I wanted to do, tacked an extra $10 each month to my bill, cutting into the savings over my previous provider. Once he got to my house, the tech introduced himself, asked me where the outside wiring for my current service is (I had no idea), and began the process. The install was done using mostly existing wiring, though because the service is delivered over phone lines and not cable lines, I had to place my new Frontier-provided modem/router in a different location than I would have chosen otherwise. The cable part of the package works a lot like my old service, but with more channels (a lot more) and a DVR that works on all three TVs in my house. Frontier offers good on-screen interfaces and even some shortcuts to various channel groupings including "sports" and "family." It was even possible to program the remote to only flip through the channels I actually care about. Figuring out how to do that took some trial and error as well as an online chat with customer service that was less than helpful. Still, it was possible without too much trouble, making it easy enough to effectively eliminate the dozens of shopping and pay-per-view channels, as well as stations I don't pay for when I flip around. As for Internet service, my contract said I was buying speeds of up to 18Mbps download and up to 1.5Mbps upload. 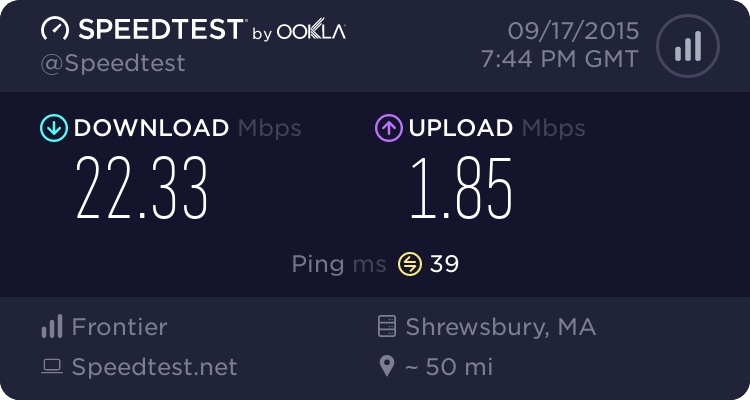 In reality, after running a test at speedtest.net, I learned that I'm actually getting better performance -- 22.83Mbps download and 1.85Mbps upload -- than what I contracted for. As you can see from the chart above, SpeedTest says my speeds are slower than 55% of the United States, only earning a grade of C. Still, it's better than what I was promised, and while it's only anecdotal -- since I have only done some spot-checking in the few hours since the technician left -- it does seem to be an improvement over what I had. While the experience was a little bumpy, and the inability to get a formal, all-in price quote was a bit worrisome, the overall switch was relatively smooth. I'll attribute that mostly to the top-notch salesperson who made up for inexperience (he had just been hired) with enthusiasm and attentiveness and a technician who knew his job inside-out. Overall, the savings is significant, albeit $10 less per month than I had planned on for dozens more channels and at least somewhat better Internet. Frontier, at least in this early part of my experience, has proven a capable company that delivers what it says it does. Yes, the company could use some polish on its sales technique, and its pricing should be more clear, but once you work through those things, its cable and Internet service seem like a viable alternative to its more-established rivals.